via email jtkellerphllc@gmail.com or by phone at (715) 928-2813. Onyx A is a stunning black stallion by Sundance Kid V out of the beautiful mare, Aliage SSA. He came onto the scene as a 3-year-old winning the prestigious Santa Barbara and U.S. National Western Pleasure Futurities. Given his natural fluid movement coupled with his elegant Arabian type, Onyx’s success in the performance arena continued the following year with National Championships in the Junior Horse and the AAOTR Maturity Western Pleasure divisions. As a 5-year-old, Onyx took on the open division and brought home the ultimate prize of being named the U.S. National Champion Western Pleasure. 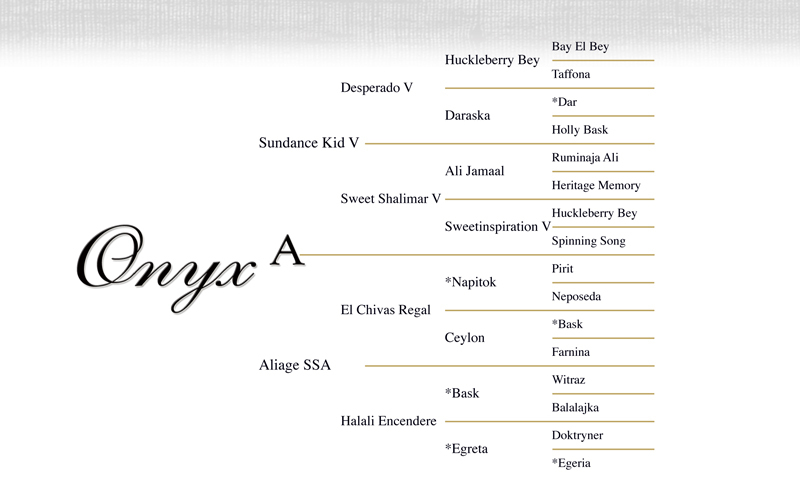 Onyx’s pedigree reads like a “who’s who”, with four crosses to *Bask and up-close lines to Desperado V, Ali Jamaal, Huckleberry Bey, *Napitok, and Doktryner. With a combination of pedigree, performance and beauty, Onyx’s foals will surely follow in their sire’s winning footsteps.